The Vindhyan sedimentary succession in central India spans a wide time bracket from the Paleoproterozoic to the Neoproterozoic period. 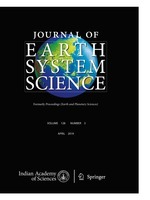 Chronostratigraphic significance of stable carbon and oxygen isotope ratios of the carbonate phase in Vindhyan sediments has been discussed in some recent studies. However, the subtle controls of facies variation, depositional setting and post-depositional diagenesis on stable isotope compositions are not yet clearly understood. The Vindhyan Supergroup hosts four carbonate units, exhibiting a wide variability in depositional processes and paleogeography. A detailed facies-specific carbon and oxygen isotope study of the carbonate units was undertaken by us to investigate the effect of these processes and to identify the least altered isotope values. It is seen that both carbon and oxygen isotope compositions have been affected by early meteoric water diagenesis. The effect of diagenetic alteration is, however, more pronounced in case of oxygen isotopes than carbon isotopes. Stable isotope compositions remained insensitive to facies only when sediments accumulated in a shallow shelf setting without being exposed. Major alteration of original isotope ratios was observed in case of shallow marine carbonates, which became exposed to meteoric fluids during early diagenetic stage. Duration of exposure possibly determined the magnitude of alteration and shift from the original values. Moreover, dolomitization is found to be accompanied by appreciable alteration of isotope compositions in some of the carbonates. The present study suggests that variations in sediment depositional settings, in particular the possibility of subaerial exposure, need to be considered while extracting chronostratigraphic significance from δ13C data.